Do you have a penchant for all things Art Deco? Is The Great Gatsby one of your all-time favorite books? 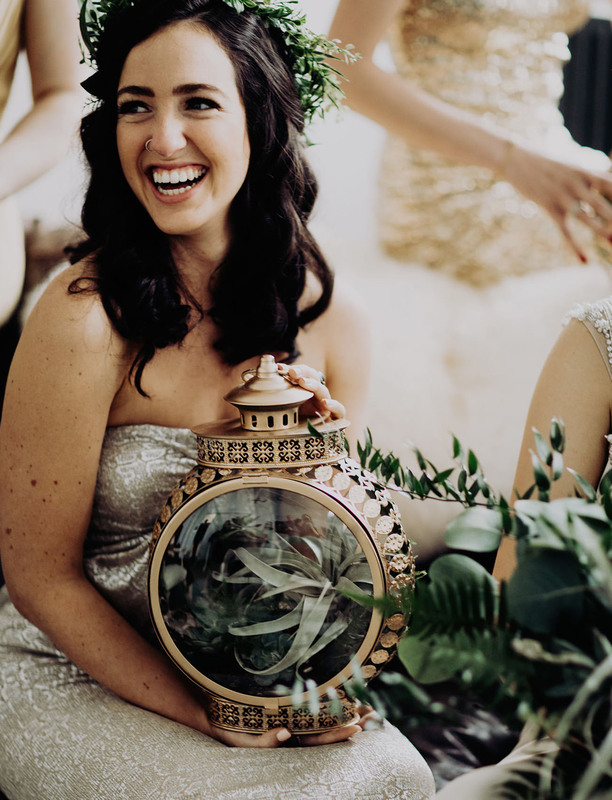 In your décor (and all home inspiration pins) is gold a major staple, rather than an accent? 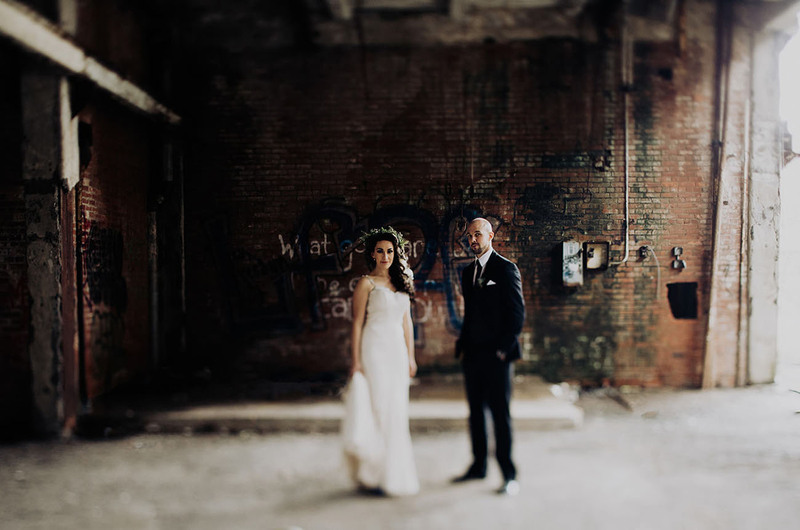 Then you’re going to absolutely FLIP over today’s DIY wedding at the Lake Erie Building in Cleveland! 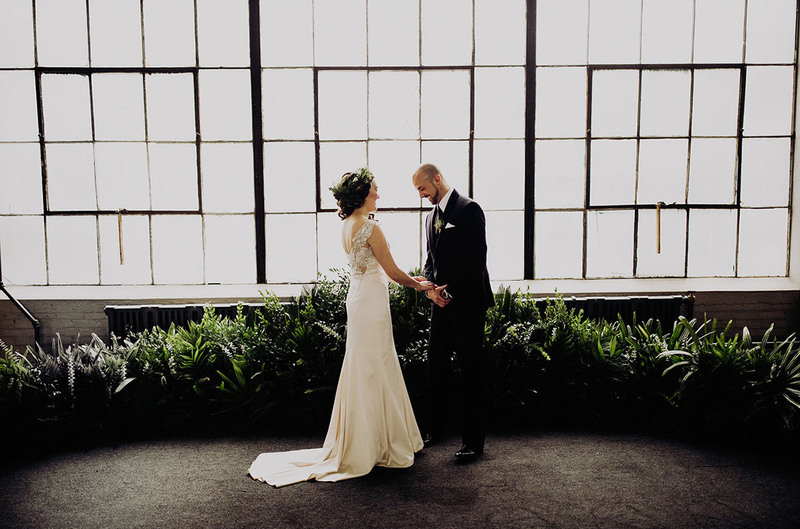 Jessica + Scott had limited time when it came to planning — she travels the world dancing on cruise ships and is home every four months for a four-week vacation. Scott visits her on the ship every time he gets a free week or two, but thanks to technology, they were able to make it all work out! 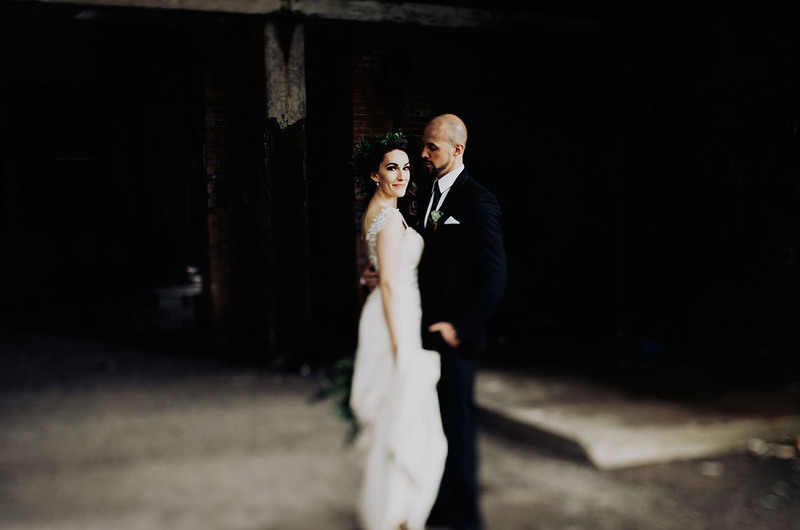 Jessica shares: We had a year and a half-long engagement, which gave us about nine weeks of actual wedding planning time. I flew home five days before the wedding from Asia. 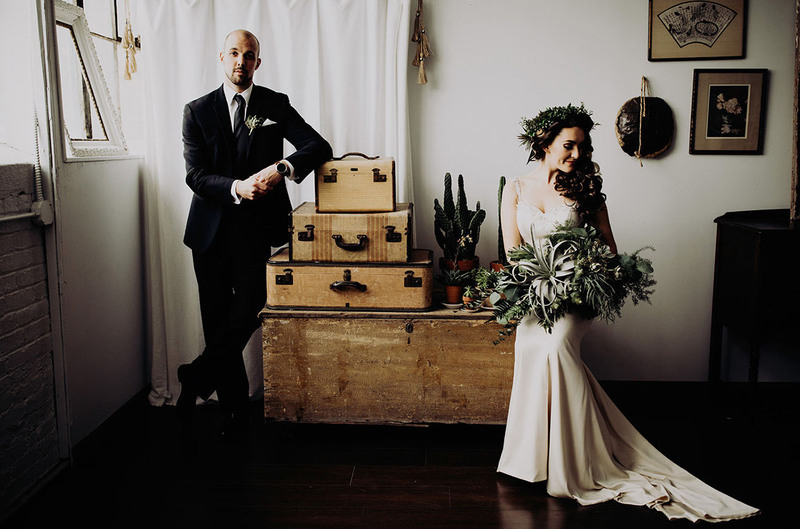 We still think it is a miracle that we got everything done without a wedding planner! 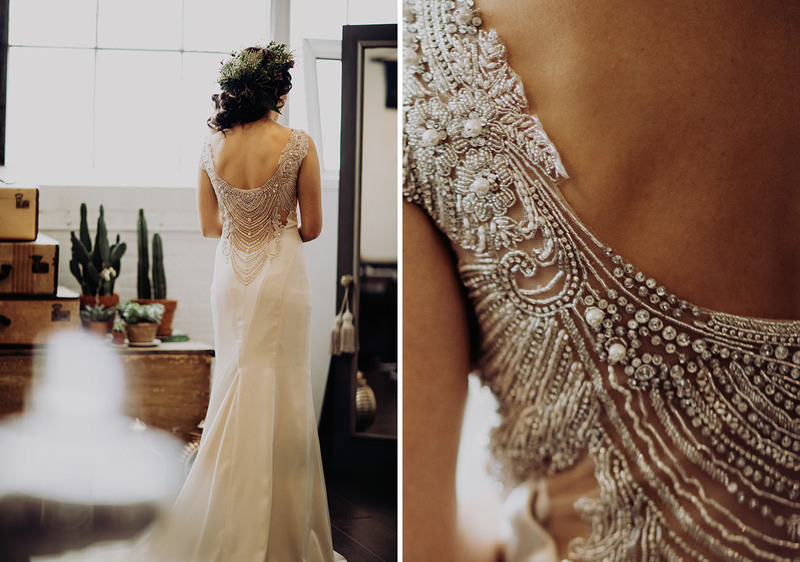 Let’s talk a walk down the glittering aisle in the photos captured by Addison Jones Photography! 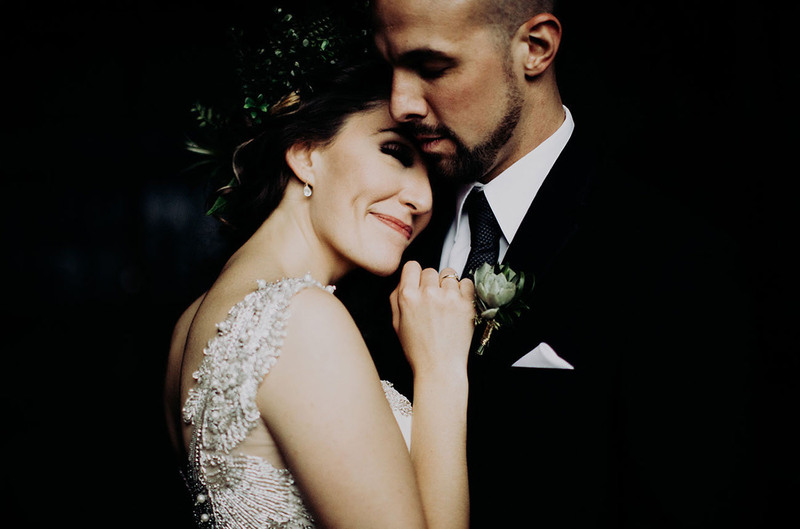 Jessica absolutely STUNNED in her beaded Casablanca Bridal gown. Okay, cool kids! The two took inspiration for their day from Jessica’s Art Deco engagement ring and their world travels. 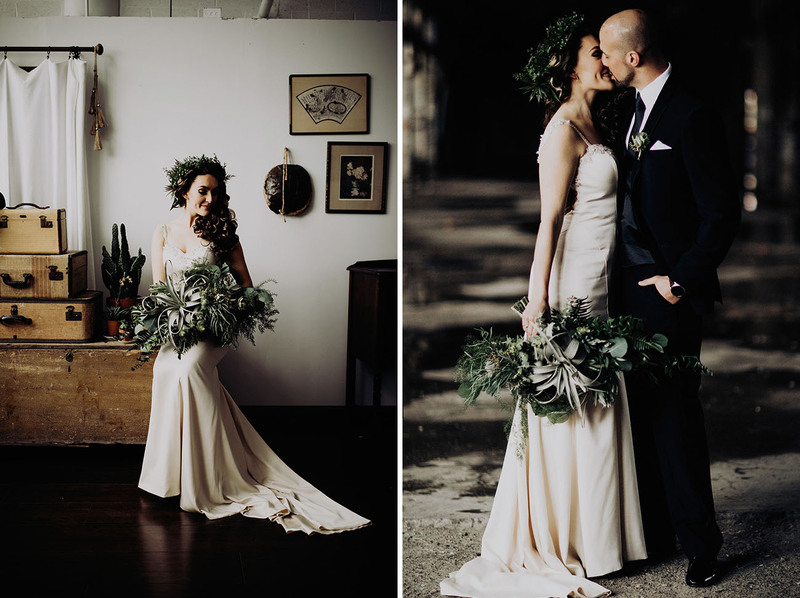 Jessica’s bouquet by Heather McCoy, and all the foliage for that matter, consisted of tons of greenery and air plants — a great way to bring the cost down and keep a gorgeous neutral palette. And how crazy cool are these lantern airplants the ladies carried?!! 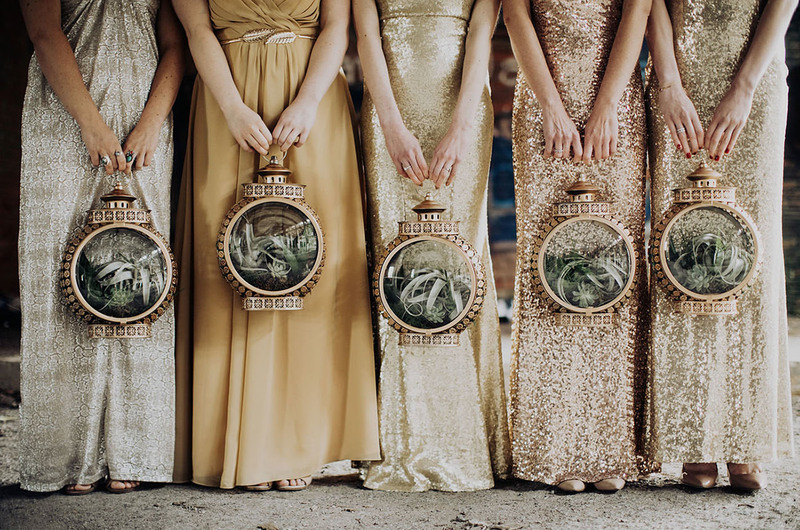 If you love them, you can purchase these for your own wedding here. 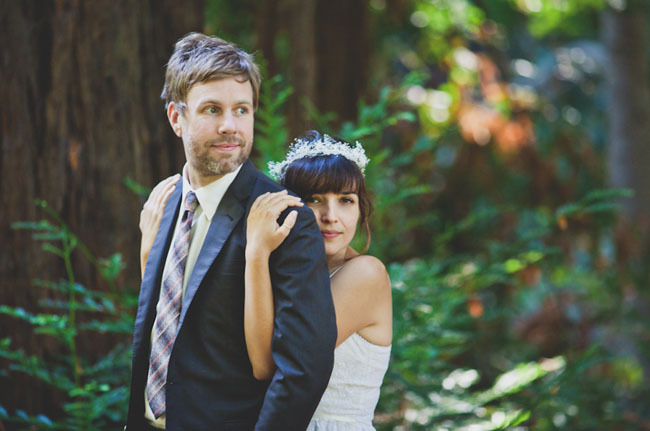 Scott and I wanted our wedding to have a huge “wow factor,” while still being budget-friendly. 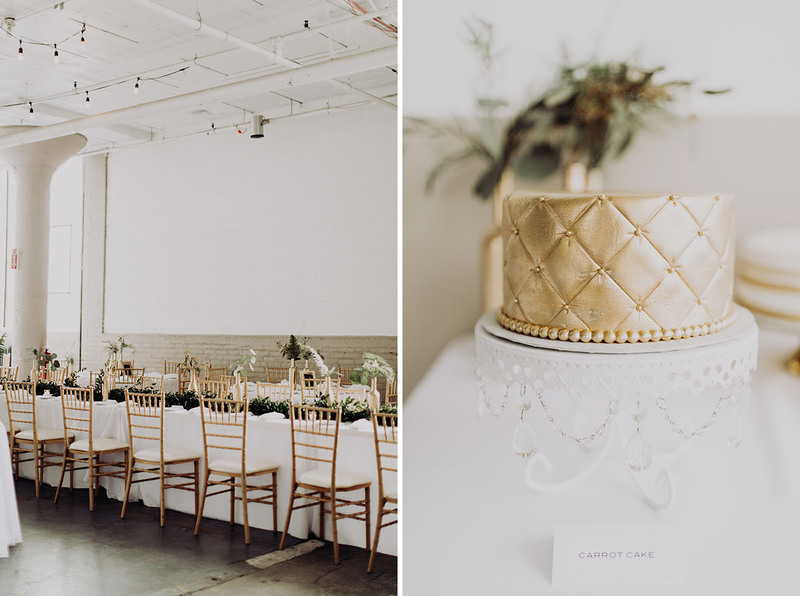 For this reason, we decided to DIY almost all of the decorations, including the hand-calligraphed signs, hanging chandeliers made from hula hoops, and 180 gold-painted wine bottle centerpieces. We made it us and that made our wedding different. My favorite part of the day was our vows. Scott and I decided to write our own, and we both ended up saying almost the exact same things! Everyone ended up thinking that we sat down and wrote them together! 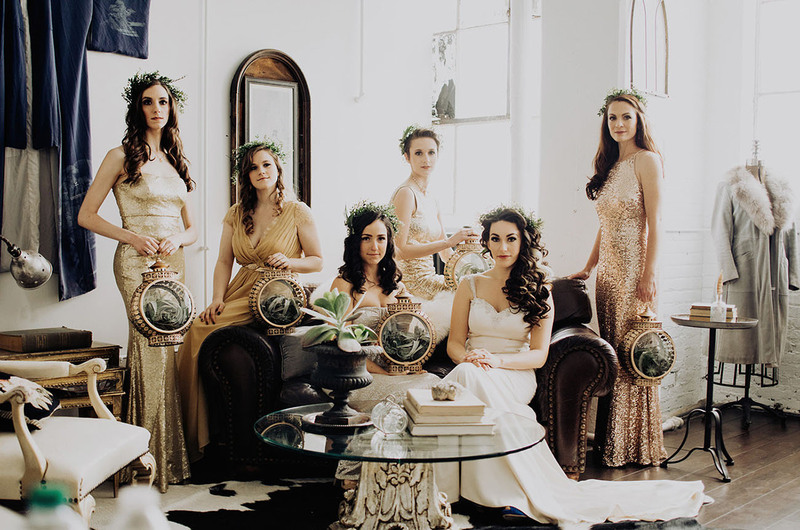 Isn’t the color palette of white, gold and green absolutely divine? 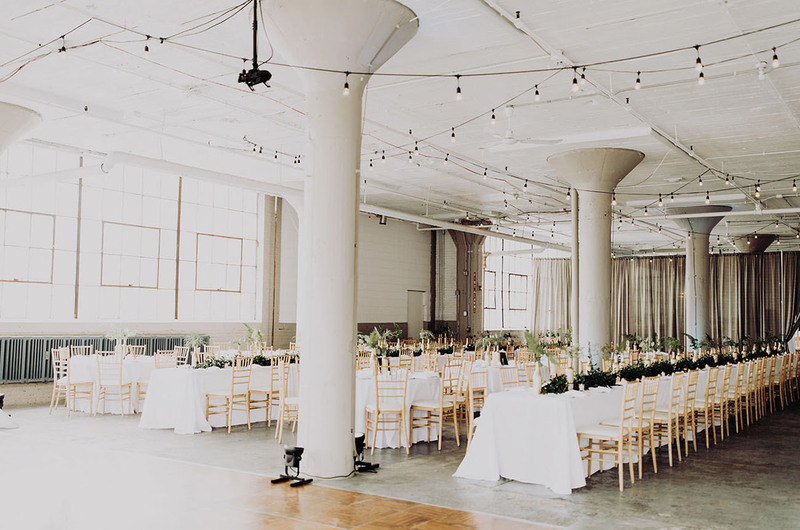 We love the way it complements the industrial space while still bringing in a luxe factor. 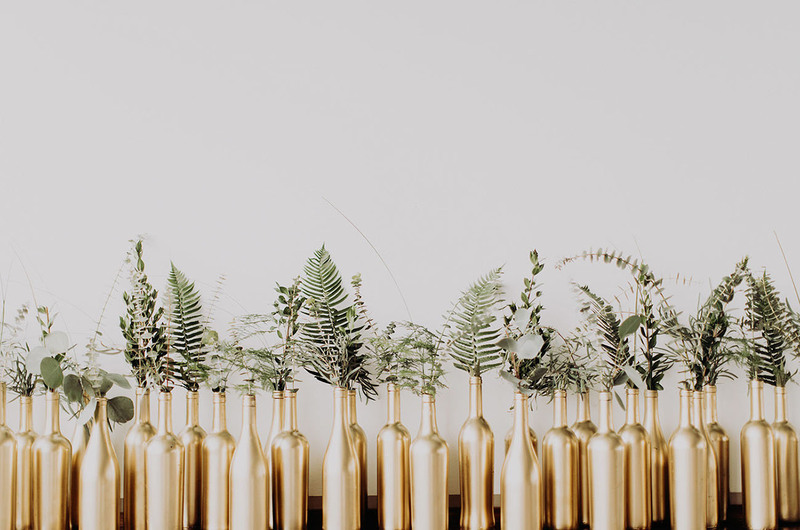 Check out those gold bottles with all the greenery! Just one of the many DIY elements from the day. Jessica tells us: The design of my ring (a yellow gold, Great Gatsby-inspired ballerina ring that Scott designed, complete with the diamond from his late grandmother’s engagement ring) was turned into a graphic featured on everything from our invitations, to one of our seven wedding cakes. 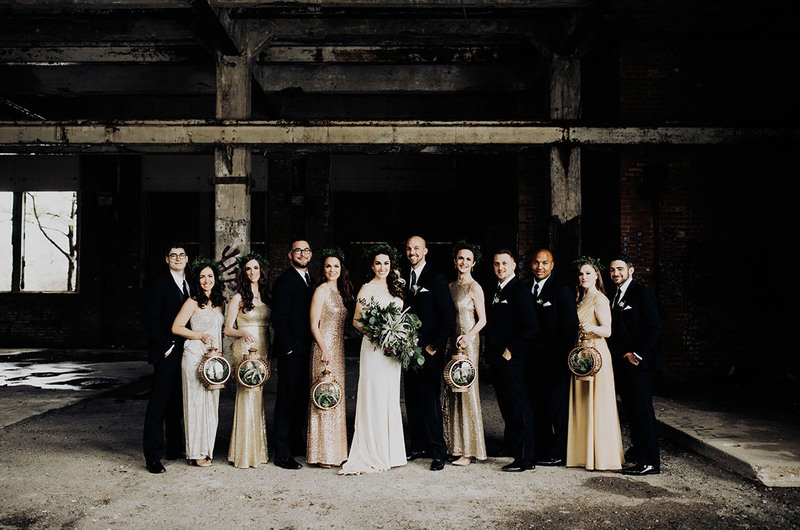 The yellow gold band determined our color scheme, and our venue was originally a factory that made the old Gatsby-style cars. So, so beautiful, you two. Wow!! 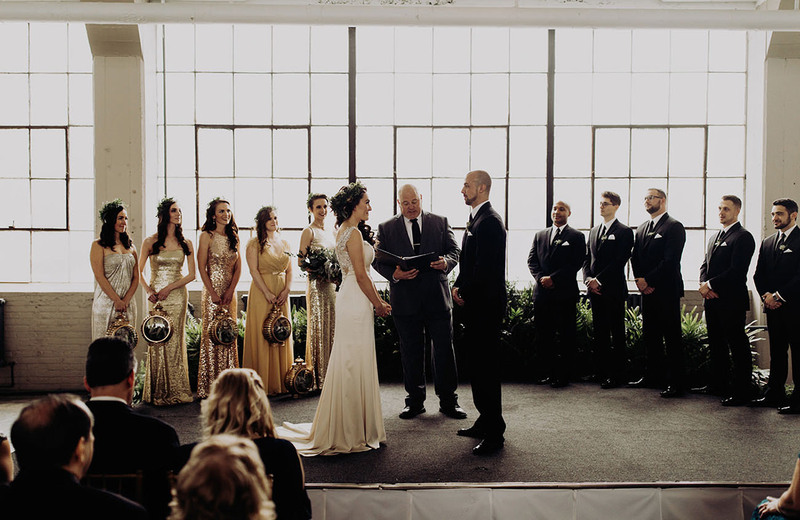 I absolutely LOVE everything about this gorgeous wedding.. all those sparkles!!! Love Love Love!! Hey, lovely post!! Thank you for this beautiful information! The arrangement done is beautiful. Keep on updating with more such posts! Ok this is pretty fabulous ! Amazing themed decoration ideas. I liked the Gold bottles with green leaves the most. That one is a very unique idea.